"I taught Texas history and official state symbols each year and the students always asked why the cowboy boot was not part of the list. I honestly did not know the answer - I told them I would investigate the process but that they would need to provide the research as to why the cowboy boot would be considered unique to Texas. I contacted my state representative, Dwayne Bohac, and asked him for his help. Since I do not live in the same congressional district as the students, this was also used as a teachable moment - students realized that your representative was elected based on where you live! The students provided research about the cowboy boot and its importance to the cattle kingdom era, significant boot makers such as Justin and Lucchese, and the impact of the cowboy boot on Texas culture today. This information was submitted to Dwayne Bohac and his office then began the process. We submitted it as "The Official State Shoe" (that is what the students decided), but the House of Representatives revised the title to be "The Official State Footwear." The proposition was then sent to the Senate ... where it was almost killed ... but with the help of Senator Dan Patrick HCR 151 the bill was finally passed! It was a year-long process and students really experienced the political process of how a bill becomes a law ... the kids loved it!. The project was topped off with a visit to Austin to meet the governor." RESOLVED, That the 80th Legislature of the State of Texas hereby designate the cowboy boot as the official State Footwear of Texas. 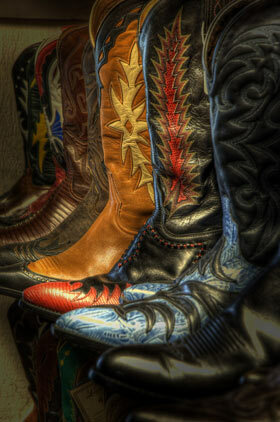 Cowboy pulling on cowboy boot; photo by katiew on Flickr (noncommercial use permitted with attribution / no derivative works).